Finished Object Friday. As if I have a finished object every Friday . . . I found this 95 percent complete shawl in a bag in the back of my closet, the source of so much mystery. It’s Susan Gutperl’s Birch Leaf Shawl, which is a frankly easier version of Sharon Miller’s all-time greatest thing ever, the timeless Rowan pattern, Birch. The yarn is Manos Lace, a baby alpaca/silk/cashmere blend that makes you glad you’re a knitter. Alvina Aqua is the shade. This simple lace pattern really, really gets me. I’ve made five of these, and I don’t really know how this one came into existence. I do have photographic evidence of it in India, so it definitely went there. I think I cranked it while the couple next to me on the plane went into Ambien coma and I was hostage to their eight-hour snooze. They were stretched out like Lincoln Logs. I thought they were dead. 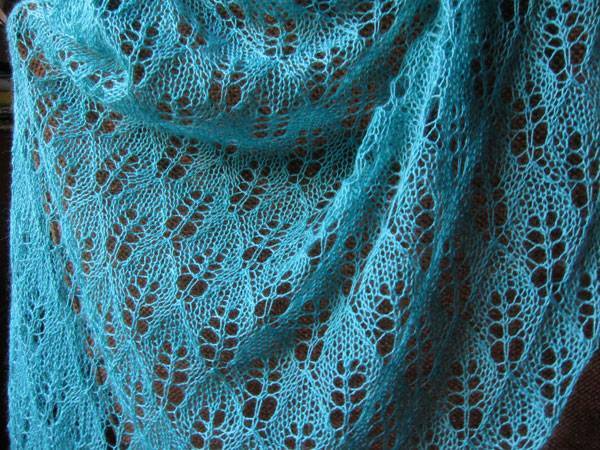 Why make the Birch Leaf Shawl instead of Birch? It’s because Susan Gutperl eliminated the 300-stitch cast on at the beginning of Birch, a soul sucker if there ever was one. Susan starts at the teeny point, and you increase until you run out of yarn, will, or time. For those wanting to dive into the cracklike yarn that is Rowan Kidsilk Haze (43 shades at this point), here are the tips I posted back in 2003, Top 10 Things to Remember When Knitting Birch. The weather in Nashville is incredible. Wishing you a lot of nothin’ this weekend. Such a pretty colour! I have made only one Birch and one of the other ones.. . Kiri? Polly’s upside-down Birch. And I must say I’ll take the enormous cast-on, because it’s just all downhill from there. Then the phone rang and I got distracted… but I went and read your tips. You have nothing to lose but your mind, so true. Oo that’s purty! I have some handspun alpaca from Peru that is waiting patiently to become Birch. Scrumptious! The color, the lacy-ness, everything. This takes me back, too, to the days of knitting listservs, where I confided my issues with Birch, my first-ever lace project. A fellow Birch-er kindly led me to your blog, and I got hooked to all of it: Mason-Dixon, KSH, lace-shawl-knitting. I have made a few Birches since, and like SquareMary, I kind of liked the feeling of great momentum once I had “only” 200 sts left on the needles. Really pretty. I did laugh when I read that you think you were knitting this in the spring yet have no memory of it. Makes me feel better. “They were stretched out like Lincoln Logs. I thought they were dead”. This made me laugh! It goes right up there with the line “It was shaped like a bucket” that Kay once wrote when referring to a log cabin blanket she had been given to straighten out. I really appreciate the humor! The shawl is quite lovely. I think that blocking it gave it the type of neat and orderly look which inspires in me a kind of hushed feeling of awe when I see it. Very lovely, very meditative. very pretty indeed. I have a secret stash of Kid Silk Haze haunting my cabinet. maybe someday. I think I have a secret stash of Kid Silk Haze too. The shawl is exquisite, as is the colour. Thanks for the link to the Top Ten Things to Remember. 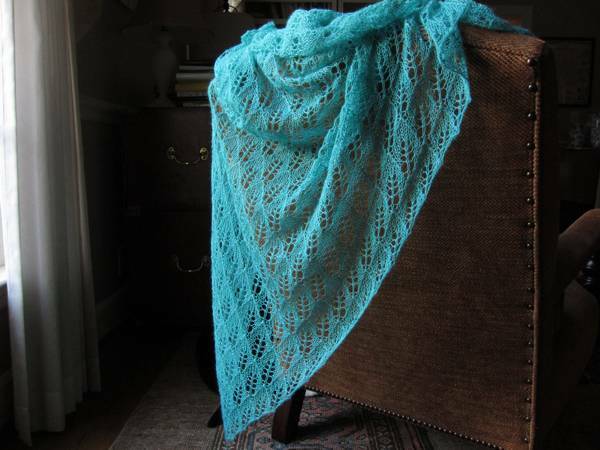 I have a shawl in my future….. It is beautiful! I have admired this stitch pattern for a while and bought a sock pattern that included it, but did not yet attempt it. I like that it has holes, but not too many holes. Birch has been on my to-knit list since before Ravelry existed. I think it was published about a week after I started knitting, and I even bought the KidSilk Haze to knit it with. I waited another few months to begin it – honing those knitting skills, you know — but the KSH almost killed me on the first row. So I have never knit it, or knit anything out of KSH, although I have quite a bit in my stash. (I see from comments before me that I am not alone with this!) My lace-knitting skills are pretty advanced now, so perhaps Birch (or Birch Leaf, or Kiri) needs to go into my Rav queue for real…. So glad you are back blogging! I’ve read both your books a couple of times, bought lots of patterns you’ve created and put on the website, gotten lots of ideas for my own projects from things you’ve shown on the blog (and helped lots of LYS’s in the process! ), and just generally enjoyed your approaches to your projects and life as displayed in the blog. Thanks for all the great things you’ve done to encourage knitters and welcome back! Ann dear, this is one of the best-lit shots of knitting I have ever seen. The chiaro and the scuro! That pop of peacock against the brown chenille chair. I think it should be the first-ever Mason Dixon Knitting Screensaver. 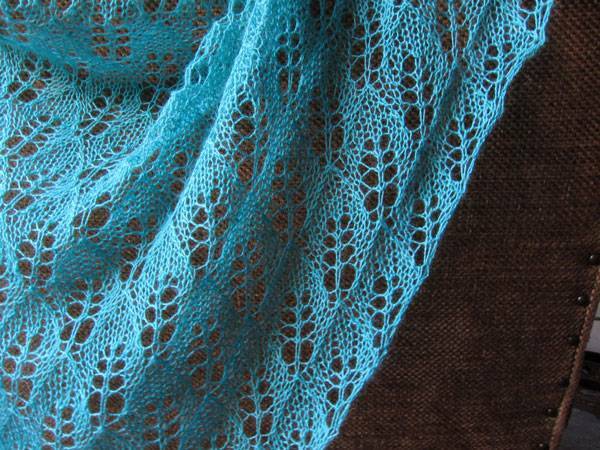 That is a wonderful and soft looking shawl. Just the thing to wrap around your neck during a long distance flight (or any flight, really, they are so horrible now). Thanks for the chuckle about your seatmates. Someone live tweeted a drunk person commentary in the seat in front and it was horrifying and real. Glad yours might have only been dead ish.